What Is Eating My Holly Leaves? 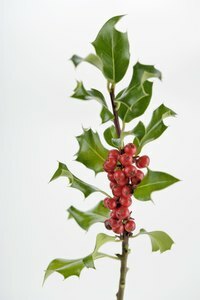 The evergreen plant known as American or Christmas holly appeals to wild birds and animals that eat the leaves and berries. Insects also find the leaves make a tasty treat. The shrub often grows to the size of a small tree, ranging in size from 25 to 60 feet high in warmer regions. While the plant features stiff leaves with sharp points, the foliage causes few problems for the wildlife and birds that flock to its branches for a taste. According to the Lady Bird Johnson Wildflower Center at the University of Texas, at least 18 species of birds rely on the holly bush as an important food source. Cedar waxwings and cardinals find the hard red fruits provide an important source of food. Blue jays, mourning doves and ruffed grouse also eat the berries. One of the woodpecker species, the flicker, feasts on the berries, snatching them off the plant in late summer and into winter. Turkeys also reach up into the bush to eat the tasty red treats. After birds eat the berries, they help disseminate the seeds to other areas of the forest with new seedlings appearing in the spring. Deer often feed on the leaves and berries of the holly bush, especially in winter when food gets scarce. The tender new leaves also get a deer’s attention in the spring. Cattle also browse on the foliage. A few insects prey on holly, although most head to the plant during the summer. While bees, wasps, ants, yellow jackets and night-flying moths may linger near the tree, they primarily help pollinate the plant, an important natural event that helps the plant produce fruit. They do not eat the foliage. Nearly 30 species of insects attack holly, according to the United States Department of Agriculture. Of these pests, red miners cause the most damage by slowing down leaf and twig growth while turning the foliage yellow or brown. Holly leafminers also do damage to the plant, causing the leaves to fall off prematurely. Scale insects also feed on holly, causing unsightly damage to the leaves.